GREEN BAY — The Packers took a 7-3 lead into the second quarter of Sunday’s game at Bank of America Stadium. The Packers won the toss and elected to defer their choice to the second half. Carolina began its first possession at its 30-yard line. Right away, the Panthers turned to their running game. Three straight runs moved the sticks. A one-handed catch by Greg Olsen produced a 23-yard gain to the Packers 33-yard line. Newton then scrambled for 23 yards to the 10. A pass to Jerricho Cotchery carried to the 3, a Mike Tolbert run gained one and on third-and-goal Newton threw the ball away. Graham Gano kicked a 20-yard field goal, 7-0, with 10:12 to play in the first quarter. Green Bay began its first possession at its 25. A third-down sack forced a three-and-out. Following a 15-yard punt return by Micah Hyde, the Packers had the ball at their 35-yard line. Aaron Rodgers gained a first down with a 18-yard toss to Aaron Ripkowski. 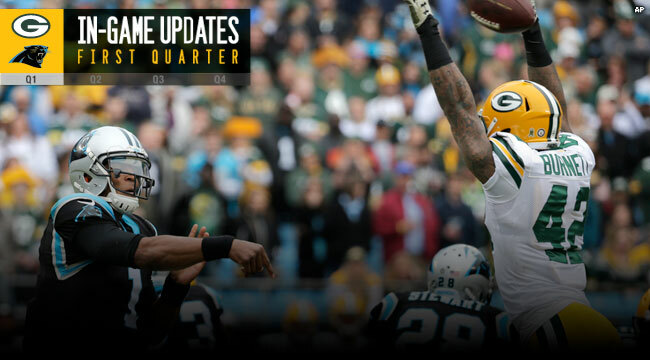 On third-and-12, Rodgers completed a 13-yard pass to Davante Adams at the Panthers 36. Consecutive runs by James Starks gained 13 yards, and Rodgers followed with a 4-yard pass to Adams. On second-and-6, Starks broke loose over right tackle and gained 15 yards to the 4-yard line. Eddie Lacy carried to the 1. On the next play, Rodgers threw to Richard Rodgers for a touchdown, 7-3, with :55 to play in the first quarter.